When one thinks of classic bass amps, the brand name "Ampeg" often comes to mind. Their SVT models were very popular and still are today. Slightly less known Ampeg combo-type models were also made, called "Portaflex" amps. In "travel" form, these appeared to be simple closed back speaker cabs with a pair of chrome latches on either side of the top panel. When one released the latches, the top panel could be removed and flipped over to reveal a tube head unit. One simply plugged in the attached speaker cable and the amp was ready to go. The unique design led to the nickname of "Flip Tops." 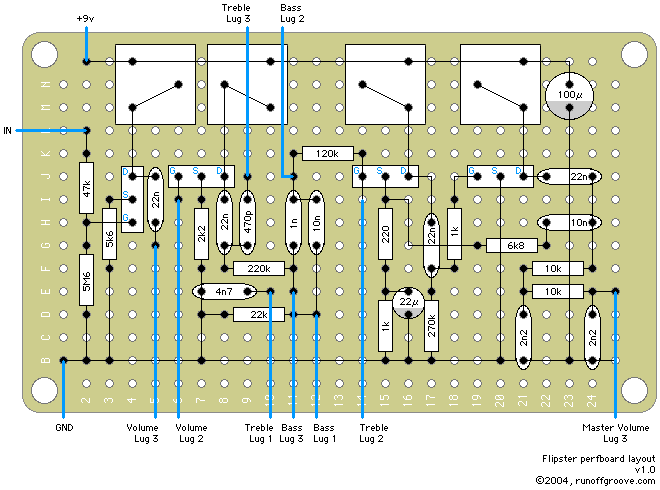 We looked at many schematics for the vintage Ampeg bass amps and came to the conclusion the popular SVT is very similar to the Portaflex models as far as circuit topology goes. The Portaflex models are simplified versions of the SVT model. We picked one of the Portaflexes to keep our circuit as straight-forward as possible. We named the circuit the Flipster, a take-off of the nickname of the old amps. We chose the SB-12 model Portaflex as our starting point for a FET-based bass overdrive. It is simple, and we had an historical reference: a member of the runoffgroove.com team had once owned a late "60s SB-12. "I found that I liked the sound the best with the drain voltages at 7 Volts." "To my ears, this sounds best with an MPF102 as Q4, and J201s in the other positions. I got nice clean tones with drive settings up to 5, OD kicking in at around 6 with Bass and Treble controls at 5.
and working the tone control on my bass I was able to get a little more sensitivity out of the rig." "Well I haven't heard a real Ampeg before but this one sounds sweet... ...sounds nice when used with a picked bass." Many thanks to the beta testers! As seen on the schematic, you can try any number of N-channel JFETs in the circuit. Some beta testers found the circuit, when fully loaded with J201, had too little headroom. By mixing J201 and with lower gain FETs, such as 2N5457 or MPF102, the gain level can be customized to your taste. Use the Duncan Tone Stack Calculator and tailor the EQ to your liking. Use the "James" model as your starting point. Flipster by runoffgroove.com is licensed under a Creative Commons Attribution-NonCommercial-ShareAlike 3.0 Unported License.